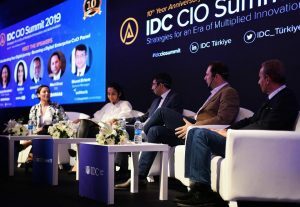 IDC CIO Summit was held for the 10th time in Antalya with the initiative of the ‘Age of Innovation and Strategic Approach to Automation’. With Softtech’s attendance to the summit, both global as well as local trends of the IT sector were addressed and discussed in addition to the digital transformation. During Mr. Murat Ertem’s (General Manager of Softtech) speech at the ‘Speeding up Your Digital Journey: Becoming a Digital Business” panel, he said “In addition to being a tech firm, Softtech is also well considered a Human Resources firm. Therefore, we aim to focus on people in all of our work. For this reason, we have invested in human resources process management based on the “Learning Agility” approach. We acquired this HR process management through a representation of a company abroad. Professionals, especially working in technology companies, can’t seem to survive anymore with the schools they graduated from. Due to the fact that information nowadays undergoes continuous renewal and expansion, we are endlessly looking for answers to questions such as ’Do you have strategic thinking?‘, ‘How do you adapt to the changes?’, ‘How do you work with people coming with such diverse backgrounds? ‘and ’Are you results-oriented?. The important thing is that they are open to learning. Because information needs to renew itself and expand continuously.